A Schnoodle is a cross between a Schnauzer and a Poodle. It’s hard to say what a typical one looks like as they range in size from very small to very large and their coats come in a variety of colours. A Schnoodle can be any combination of these. 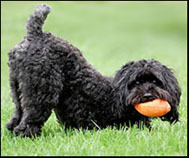 Schnoodles are also classified as Giant, Standard, Miniature or Toy. The most common of these is the Miniature, which usually weighs between 10 to 16 pounds. The Giant can weigh up to 80 pounds. Are Schnoodles Suitable for Allergy Sufferers? With more than 10% of Americans suffering from allergies, there are a lot of dog lovers out there searching for a pet that won’t make them sneeze. 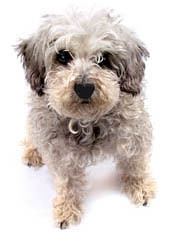 All 3 types of Schnauzer and 3 types of Poodle and most Schnoodles are considered to be non shedding and hypoallergenic. That means they are LESS likely to cause an allergic reaction. Like humans, Schnoodle puppies inherit characteristics from their parents. If 2 Miniature Schnauzers breed, you can be pretty sure what the pups will look like. When a Poodle and a Schnauzer breed, the resulting Schnoodle will probably look more like one parent that the other - just like we do. The puppy may have a wiry coat like the Schnauzer, a softer coat like the Poodle or often a combination of the two. However, because both parents are hypoallergenic the probability is that the Schnoodle will be too. • and easy to train. But with popularity there came a price. 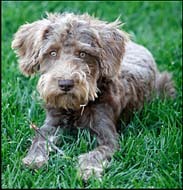 The Schnoodle began to face the same hazard as other popular dog breeds - unethical breeding to make a fast buck. In some cases the result has been indiscriminate breeding of almost any Poodle to any Schnauzer. No attention has been paid to the health, temperament or backgrounds of the dogs. Can I Get a Purebred? 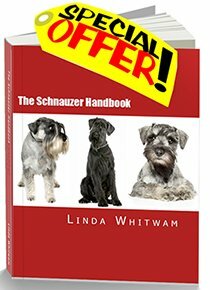 No, a Schnoodle is a Poodle Schnauzer crossbreed or a hybrid. Puppies are not eligible for registration with purebred or pedigree registries such as the American, Canadian or UK Kennel Clubs. However, in the USA they can be registered with the American Canine Hybrid Club. The Schnoodle is not considered a purebred. It doesn’t ‘breed true’, meaning that it doesn’t display a consistent set of characteristics. That's why Schnoodles come in all shapes and sizes. One of the hottest arguments you'll ever hear between dog lovers is the one between the owner of a pure bred - with papers showing an impressive lineage - and the owner of a common or garden mongrel or crossbreed who reckons his dog is well, er...better! Schnoodle Puppies- Saviors or Scoundrels?